My son's grandparents bought him an Imaginext Space Shuttle for Christmas. Ever since then he has been rocket crazy! He pretends his paper airplanes are rockets. He wanted a rocket cake for his birthday. He followed the Space Shuttle Discovery's last flight and watched the landing live on NASA TV. Someday he wants to fly up to the moon in a rocket. So, when I heard about the newly released board book by Bob Logan called Rocket Town, I just knew that my toddler would love it. 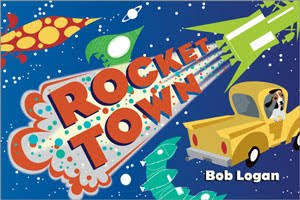 Bob Logan, in his new rocket-themed book, welcomes readers to Rocket Town, an unusual community where most residents ride in rockets -- big rockets, small rockets, school bus rockets, ice-cream truck rockets, scooter rockets, and so on. It's a place where, "everyone has a favorite rocket." The area kids carry rocket-shaped balloons and go on rocket carnival rides. One man, dressed in an astronaut suit, seems a little out-of-place in Rocket Town. He drives an old, yellow pick-up truck through town, accompanied by his loyal Beagle dog. They wizz by all sorts of different rockets, finally arriving at "Rocket Ray's Rockets," a rocket sales lot. After a brief search, astronaut man finds a special rocket suited perfectly to his taste and blasts off into space. Logan's board book belongs in a book galaxy all its own. With enthralling art and simple text it's very appealing to toddlers (especially rocket-crazed toddlers like my own), but due to the complexity of the illustrations and flashy rocket theme, older kids will find themselves drawn into the details. My daughter pointed out that all the baby strollers in the book are rockets, and she loves the "just married" rocket carriage that blows heart shaped exhaust. My son thinks the green "stinky onion" rocket is hilarious. The unique, digitally rendered illustrations are done in retro-pop style. The illustrations also look slightly futuristic with a rockets and space art theme (think Hanna Barbera's Jetsons crossed with the latest in animation technology). Logan primarily works as a story artist for DreamWorks and his animation talent is apparent in the pages of this book. Now typically I'm not a huge fan of board books because most are versions of picture books formatted in a downsized design to fit babies and toddlers. However, Rocket Town was never released in picture book form and is specifically designed with the toddler/preschool audience in mind. 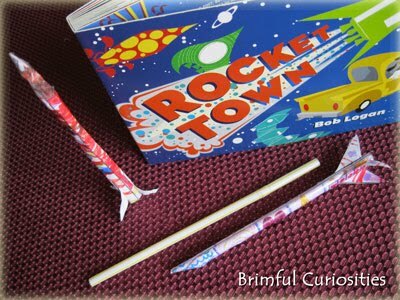 Rocket Town is a counting book (it has an awesome countdown to blast off), and the book also teaches opposites by comparing various rocket sizes, speeds and travel directions. Measuring 9 in. wide x 6 in. high, it's a medium-sized board book designed with larger page spreads to properly showcase Logan's fantastic artwork. Part of me wishes that the book had a more elaborate storyline presented in a picture book format -- the Rocket Town idea is so fascinating! But sometimes simpler is better, and toddlers/preschoolers certainly deserve original, high quality stories of their own. At $7.99, this book is bargain! Blast off to your nearest book store and pick this one up to liven up your young child's board book collection! What kid hasn't tried launching the paper wrapper off a drinking straw? Using this fun activity as inspiration, we decided to color and build our own paper rockets that fly, propelled by the air from our lungs! I found an online printable template perfect for this week's craft: Kids’ Science Challenge - Build A Soda Straw Rocket [pdf]. 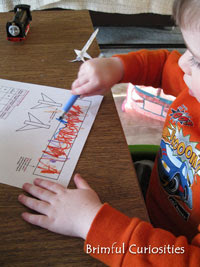 The pdf provides detailed instructions on how to build paper rockets that you launch using straws. My kids spent quite a bit of time coloring the body and fin units. 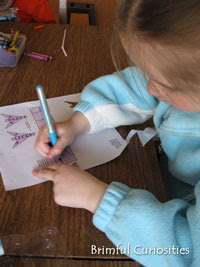 After they finished coloring, I assembled the rockets (older kids would be able to do this step themselves). Then we went outside and launched the rockets. This activity also makes a great science project. By changing the style of the fins and the endnose, the builder can control how far the rocket flies through the air. We didn't experiment with different designs, but we did measure how far our rockets flew. The longest flight equaled 22 feet! The rockets are super simple to build and extremely cheap to make. All you need is a piece of paper, a straw, a pencil, scissors and some tape. A few tricks we learned: we wrapped our rectangular body pieces around a thick pencil to get the proper cylinder size (it's a little larger than the straw). We used the end of the pencil to help us make a pointed nose cone. To avoid air leaks, we found it necessary to tape along the entire body seam. Use tape to seal the end nose, as well. *Book images used with permission: Art from Rocket Town ©2011 by Bob Logan, Sourcebooks. Oh my word! Oh my word! Oh my word!!! I LOVE THESE!!!! How much fun are they?!?!?! We WILL be making these ASAP! Thanks for a truly fabulous idea!! LOVE LOVE LOVE this idea!!!!!! We love Imaginext toys too. Thankyou for the link to the template - we are sooooo doing this one! How awesome! We will be doing this one too for sure. Thanks for the link. The book looks pretty interesting too, so I'll make sure to pick it up in the library if I stumble upon it. The book looks fabulous and so does the craft!! I love it!! Firstly I need to tell you that I just LOVE the name of your blog! And this is just the coolest, fun-filled activity! Thanks for sharing! I love the way you made it child(fool)proof! I can even do this, so my 3yo I bet can too! 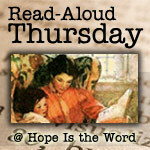 Thanks so much for sharing at It's Playtime this week. Hope to see you again next week too! Great books! I'm going to keep an eye out for these for the grands. Those look fun! Thanks for sharing! FUNNNNN!! My kids are going to go nuts for this!! SO fun! My kids will love making these! JDaniel would love launching a rocket! 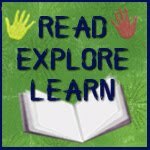 What a great book and idea! What a great activity!! My son would love to play with one of these!! Thanks again for sharing this super-easy way to make straw rockets! I featured it on today's It's Playtime/High Five. I hope you can come play with us again this week! OOOh looks so easy to do. Wonder if my 8 yr old would like it??!! Anyways I was just stopping by to give you a high five today for doing such a great job here!